It was an Karwa Chauth night yesterday where Bollywood celebrities and Telly Celebs were decked in the most traditional way to celebrate this auspicious day. Karwa Chauth is celebration of institution of marriage, wherein you fast and pray for your better half for healthy and happy life. Glamour world is not an exception for his festival who reserve this special day to celebrate Karwa Chauth. Be it on-screen or off-screen,celebrities are always looked up for their style and fashion. And when its festival celebration, we cannot miss to watch what ensemble and ornaments did our favourite celebrity wear. After all, we are all inspired from the fashion statement we get from the B-town. We have few best ‘Karwa Chauth’ moments from the Bollywood movies and daily soap but in reality too, we have celebrities who follow this traditional Hindu festival with total enthusiasm and passion. Let’s take a look at the Bollywood and TV Celebs who have been rocking the best conventional avatar. 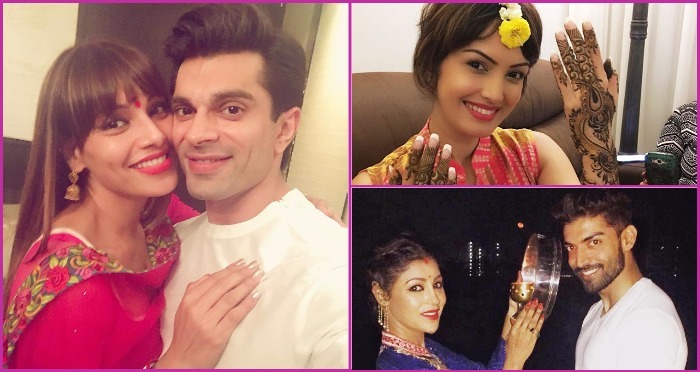 Bipasha Basu Singh Grover : It was her first Karwa Chauth after getting hitched to Karan Singh Grover and girls she totally rocked the traditional getup. Sanaya Irani: TV star Sanaya Irani married her long time boy friend and co-actor Mohit Sehgal on January 25 this year. It was her first Karwa Chauth and we cannot get our eyes off from the beautiful heena and simple yet elegant salwar. Preity Zinta: Preity married her long time beau Gene Goodenough, who is US based in the Feb 2016. Because Preity Zinta belongs to North India we expected she will be celebrating her first Karwa, though she did not share the complete pic. All we can see is that beautiful diamond engagement ring and red hot nail polish with that tagline. Here's wishing all the lovely married ladies " A very #happykarvachauth? From me in my favorite Karvachauth wala red nail polish ? Ting ? Divyanka Tripathi Dahiya: Divyanka is a newly married popular TV celeb. Because of her hectic schedule she could not get to celebrate her first Karwa Chauth with her beau Vivek Dahiya. But, she celebrated Karwa Chauth on the sets in the sweetest way, awww!! Vivek too gave the best lovely reply to her wife. Neil Nitin Mukesh: Awww!! How sweet! Neil Nitin Mukesh is the only man in the Bollywood to fast for his fiance. Neil and Rukmini had got engaged on Dussehra and both the lovebirds celebrated first Karwa Chauth together. How romantic!! Also Read: Congratulations! Neil Nitin Mukesh Gets Engaged To Rukmini Sahay! Divya Khosla Kumar: Ohh man, I love this gorgeous woman. She wore Masaba Gupta lehenga adorned herself in the beautiful jewellery from Anmol. How can you be so refreshing while at Karwa Chauth fast!! I loved those pom-pom knot though. Debina Bonnerjee: Debina and Gurmeet make a beautiful couple who married in the year 2011. Debina was spotted in total traditional avatar celebrating Karwa Chauth. Maanayata Dutt: Sanjay Dutt’s wifey Maanyata celebrate Karwa Chauth with all the faith and devotion every year. Ankita Bhargava: Though it was second Karwa Chauth for Ankita Bhargava, she nailed it. Karan Patel and Ankita got married in the year 2015, May. Nisha Rawal: Big Boss 10 contestant Karan Mehra aka Naitak’s wifey Nishha Rawal too celebrated this festive. Karan is at #BB10 show and Nisha she sent the wishes to him through the moon. Love has no limits gals! Previous : Post M.S Dhoni Success, Sushant Singh Rajput Hikes His Fees To 4 Crores!